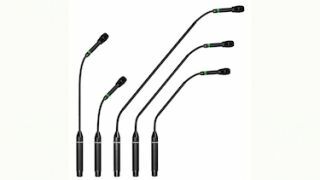 The What: Earthworks has expanded its FlexMic Series of podium microphones to include the FMLR models, which feature a single color LED light ring at the top of the microphone. The What Else: The LED light ring can be programmed via an external media control system to indicate on/off status. The FMLR microphones are available with either a green or red LED light ring. The FMLR models feature a fully flexible gooseneck and are available in 13 and 19 inch versions, while the FMRLR models have a rigid center with flex at both ends and are available in 19, 23 and 27 inch lengths. All FlexMic models are available with either a cardioid or hypercardioid polar pattern and feature a slim 7mm diameter gooseneck, providing a low profile miking solution. The FMLR Series FlexMics utilize Earthworks’ patented polar technology, which allows orators to move as much as 70 degrees off-axis on either side, as well as above or below the mic while maintaining the same pristine sound quality with high intelligibility. The Bottom Line: The FMLR Series FlexMics are shipping Q3 2016.